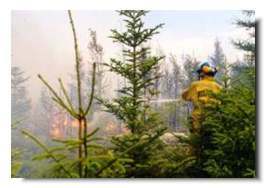 Developed to provide basic fire suppression training that would enable first responders to safely and effectively manage forest fires. It is intended for members of fire departments, industry, community college students, and those interested in wildland fire fighting. Traditionally this course is delivered to students in two parts: a classroom session followed by a practical outdoor session with working equipment. The online BFFSC consists of a self paced learning program that covers materials presented in the classroom component that must be followed up by the practical field session with a certified course instructor.